Negreni 2012. A Whole Bunch of Gabors! 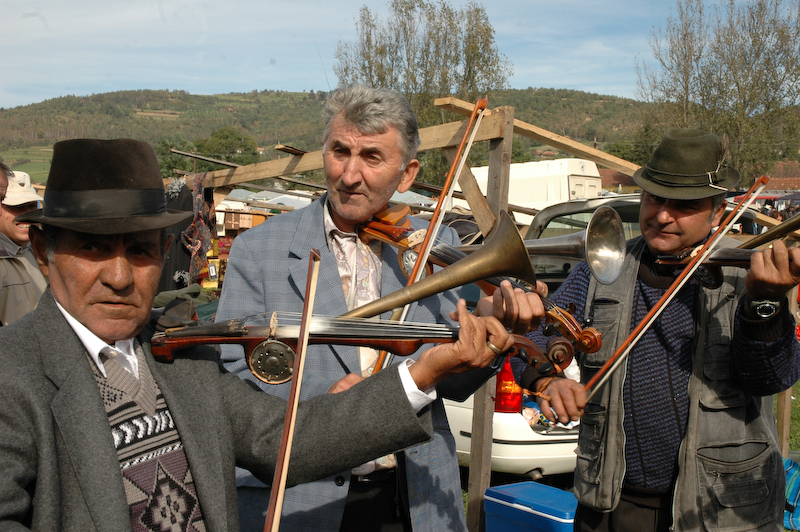 This year was a bit sad for those of us who love this region’s wild, vibrant folk fiddle tradition: the vioara cu goarna music that is played in the villages around Negreni and Bihor county. The fair was one of the annual gathering places for the makers and fiddlers of this unique “trumpet fiddle” (actually a homemade resonator violin with a horn to amplify the sound.) But this year saw the passing of two of the local masters. Dorel Kordoban, master fiddle maker and musician from the village of Lazuri passed away last spring. And then the elder Gypsy fiddler Traian Ardelean was murdered in nearby Alesd in the summer. I did get a chance to meet with Mircea Roastas, but his health is not good and he wasn’t able to spend much time at the fair. I would not worry about the tradition dying out, though.Although there were less local fiddlers at Negreni this year, I found one, Gutu from the village of Balnaca, at one of the beer tents, and he was in fine form. 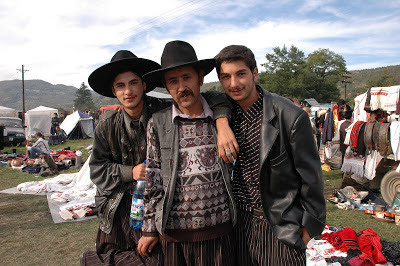 I have heard a lot from people who ask “What about that big Gypsy festival in Transylvania?”Well, if you want Gypsies, you can find them at Negreni. A lot of them. But it is not q Gypsy festival as much as a homecoming where different families, clans, and tribes touch base with each other year after year. Some refer to themselves as Roma, some do not. Some keep to a strong sense of Gypsy moral code and law, some less so. Appearances can be deceiving. You can be sitting next to a family of Gaboresti Roma who proudly wear the broad cowboy hats, handlebar moustaches, the women in flamboyant skirts, that one anthropologist called “a hyper-gypsy sense of dress” and then find a blonde guy in a smart business suit chatting with them in Romani about a shipment of plastic shoes arriving at the airport from Istanbul. The Fair attracts a lot of Gaboresti - the clan known as "Gabor Gypsies." Why? They are descended from somebody originally named Gabor. Most of the family names are "Gabor." Don;t let it worry you. They know which clan is related to whom, and who they will marry, even though you can often wind up with people named "Mrs. Gabriella Gabor Gabor Gabor." Gabors are mostly Seventh Day Adventists: they don’t drink (much – beer doesn’t count) and they work in retail and market selling. They are active in Adventist church organizations and educate their children in Gabor run schools. A lot of them are, in fact, blonde. That may reflect that the orginal extended families that congealed into the Gaboresti “nation” came from southern Transylvania in the area where Saxon German settlers have lived since the thirteenth century. There is an almost Germanic sense of “ordnung muss sein” about them. That lifestyle has led a lot of Romanians to contend that “Gabors are not Gypsies” because they are clean, hard working, all the things that define the negative stereotype of “Gypsy” in East Europe. This being Central Transylvania (on the road between Oradea and Cluj) you get not only the Gabor Gypsies, but any number of Kalderash clans who affect the Gabor style (big hats mean high prestige) but without the Gabor’s businesslike moral demeanor. But big hats and pin striped pants do not a Gabor make. If you want to live in a huge tin roofed palace, you need to do business like a Gabor. And that means a social network that the Gabors have built up through links of kin, religion, and pure hard work. 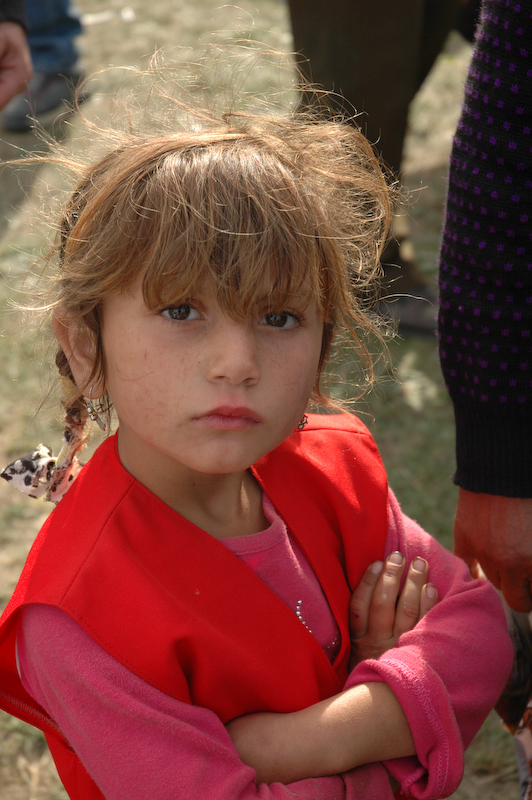 There are areas of the market that seem to have been populated by differing groups of peasant and Gypsies. The Rudari – wood carving families who do not speak Romani among themselves – set up tents and busily set about custom carving the whatever wooden implements of Transylvanian peasant life that you can’t buy at the Metro in Cluj: buckets for sheep cheese, milking stools, pig killing troughs. Hungarian Peasants from the village of Szék colonize a road on the northern edge of the Fair. They are also conservative in their dress: the costume acts as an advertisement for their presence and their business of selling folk crafts to (mostly Hungarian) customers. Across the river, women from the nearby Kalotaszeg region monopolize the antiques fair. Honestly, after decades of working with Roma and various groups of Gypsies all over east Europe, these people do not seem the least bit exotic to me anymore. Yes, I have learned to speak their language, after a fashion. I have traveled with some of these families, played music with them, toured abroad with some, gotten to know them as people, and one of the reasons I have rarely written about Gypsies is that they seem... just so normal to me.